There are two things that I'd like to praise when it comes to Paper Cities. The first is its theme as it strikes the right balance of being able to unite the twenty-one stories in this anthology into a cohesive, consistent whole yet having enough leeway to cover a variety of subject matter. The subtitle "an anthology of urban fantasy" might lull readers into thinking this is a collection featuring supernatural horrors set in modern times (ala Buffy the Vampire Slayer) but it is precisely this book's goal to wrestle back the meaning of the term into a wider, more general usage (and the title Paper Cities aptly fits the bill). Second is the story selection as all the stories are consistent when it comes to quality. They are all written beyond competence and at the same time featuring a distinct style and narrative voice. I appreciated a bulk of the stories presented here and those that I didn't particularly favor was more to my personal preference (i.e. I'm not really a fan of Hal Duncan's writing style) than a lacking on the author's part. Aside from the theme, another recurring element in the featured stories is that they tend to be dark and tragic, perhaps a necessity when tackling stories that deal with the concept. Jess Nevins is the author of the foreword and gives us a brief history of the evolution of urban fantasy--and cities--in literature. As for the stories themselves, again, there's a lot of amazing and original stories in this anthology and it was difficult for me to decide my favorites because of the diverse choices. Opening the collection is Forest Aguirre's "Andretto Walks the King's Way". Aguirre experiments with technique as our viewpoint revolves around a few key locations that recur throughout the narrative. He juggles a varied cast of characters, narrating to us their motivations, their plight, and their inevitable fate, at the same time capturing a particular milieu. "Sammarynda Deep" by Cat Sparks presents an alien culture that combines the familiar with the magical although the latter manifests itself more subtly. Sparks establishes numerous beats that make it a compelling read and what particularly impressed me was its ending which, while open-ended, was well-seeded and quite satisfying. Another story that I liked was "Godivy" by Vylar Kaftan. Language is one of the strengths of this interstitial piece but Kaftan also sprinkles this tale with sensuality, comedy, and tragedy--all in the span of a thousand words or so. 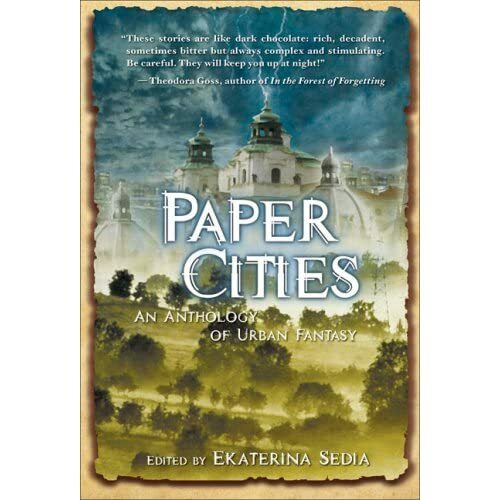 If you're looking for a sophisticated and diverse collection of short stories, Paper Cities: An Anthology of Urban Fantasy is a good choice, especially for fans of speculative fiction. I won't claim that this was an easy read but this was a very rewarding experience, fusing literary fare with an imaginative set of stories.